Recently Eaton has been paving new roads with their forward thinking supercharger product development. They have been concentrating on a market that has the most need and demand for specialty blowers. They are developing superchargers for small displacement gas engines. Eaton is expecting big things from small engines using the TVS Supercharger – Their twin vortices, four lobe roots type positive displacement blower. Turbos are currently the choice of many large manufacturers who want to add power to their vehicles but Eaton has been able to prove that turbochargers may not be the best option. Eaton claims their current roots type positive displacement supercharger can not only improve engine performance but they also provide up to five percent in fuel savings, reduced emissions and are considered maintenance free – all without the annoying lag of a turbo. Eaton’s real world examples on small vehicles include the 2011 Nissan Micra which is a supercharged 1.2 liter, 3 cylinder micro car sporting the twin four-lobe rotor Eaton TVS® blower. China’s Chery Automobile Co. jumped on board with some of their 2010 line. The Chery 1.6S Tiggo compact SUV with a 1.6 liter blown engine producing 148 horsepower @ 5500 RPM and 151 lb-ft of torque between 3500 – 4500 RPM, the compact 1.3S A3 which is supposed to perform like a 2.0 liter engine and the small sedan Riich 1.3S G3. 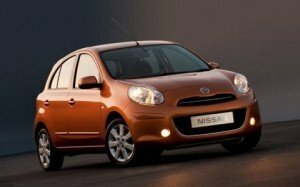 The 2011 Nissan Micra – An Eaton TVS blown monster! The extra power provided by Eaton’s superchargers works out to be an ideal fit for these small engine applications. It allows auto manufacturers to produce a smaller power plant which allows for a more compact vehicle while keeping the same horsepower with lower emissions and improved fuel efficiency. Eaton is poised to take advantage of the global trend towards smaller and more efficient vehicles, especially in some of the largest automotive markets in the world. Now that they’ve built a relationship with Mazda and have a foothold in China, which is the largest car market in the world, they have their sights set on other manufacturers and countries. Rumors indicate one of those markets is India. Eaton is already established there but reports say they are working on a deal with Tata Motors to produce a supercharged Tata Nano. Eaton’s insight and new partnerships has them going from a shrinking supercharger market to expecting sales to double by 2015. Eaton Corporation has roots back to 1911 when Joseph Eaton, Henning Taube and Viggo Torbensen founded Torbensen Gear and Axle Co. The company started off in New Jersey, USA producing seven hand built axles in their founding year. Eaton company went through many changes in the early part of its life including several name changes, a headquarters move to Cleveland, the sale and then repurchase of the company and several acquisitions of competing and complimentary businesses. Through the years Eaton continued acquisitions that took them far beyond the automotive industry. This expansion has lead Eaton Corporation to sales of $11.9 billion USD in 2009. When it comes to superchargers and supercharger kits, Eaton has remained loyal to the Roots style blower. Since the 1980’s Eaton has produced over three million Roots superchargers for street and strip. What makes Eaton’s Roots superchargers stand out is their designs. One of Eaton’s designs, the Twin Vortices Series™ (VTS™) was able to improve fuel efficiency, increase power, reduce noise and vibration and provide a smoother and more efficient air flow. The kicker is they were able to do it all in a smaller and more simple package than many previous Roots-type supercharger kits. 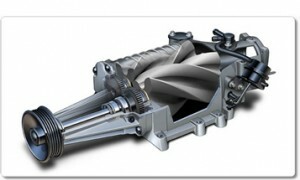 Eaton continues to work on advancing their supercharger designs. They boast a team of over 50 experts who are dedicated to designing, engineering and testing new supercharger kits. Further, Eaton has their own ‘Proving Grounds’, a 600 acres on and off-road facility in Marshall Michigan where they thoroughly test products in a real world and racing environment.